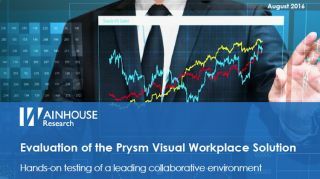 Wainhouse Research, an independent market research firm that focuses on critical issues in the unified communications and collaboration (UC&C) market, has released its evaluation of Prysm Visual Workplace. The results of the testing concluded that Prysm Visual Workplace is powerful, flexible, and enterprise-ready, and offers a number of customization options to tailor to specific use cases. The study went on to state that even beyond that, Prysm is easy and fun to use, and it takes much of the stress, and almost all of the complexity, out of real-time collaboration and brainstorming sessions. Of particular note was what Wainhouse Research referred to as the “Prysm Display Effect,” which combines large displays, a multi-touch display surface with standard gestures such as pinch and drag, streamlined and specific workflow, and the ability to resize and reposition objects quickly and easily. According to the report, when these items are combined, they work together to create an immersive experience that is both fun and somehow liberating, in a content creation and collaboration sense, for the user.